This type is with the functions of measuring, filling and Weight tolerance alarm. It』s designed according the GMP standard. 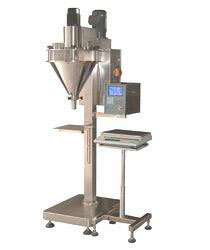 The hopper is sheer,the dust can be collected.and the working table height adjustable.over10 recipes can be saved for later using.the machine is suitable for packaging powdery product,for instance,milk powder,feed,rice powder,icing sugar coffee,monosodium glutamate,solid beverage,dextrose,solid medicament,etc. Made of stainless steel totally,the door of hopper can be side opened.